The sensation of a lump in the throat can be very distressing. Not only because of worry that it represents something more sinister, but occasionally it can prevent normal swallowing and enjoyment of food. There are many different reasons why people might get a sensation of a lump in the throat. Below is a brief description of some of the more common ones. I have mentioned some of the rarer causes as well, as they should also be excluded. Sensation of a lump in the throat. This generally comes and goes, with some weeks being worse than others. Swallowing difficulties. Typically the first bite in a meal is the hardest, as if there is a spasm in the throat. Once the first bite passes down, things may feel more open and the next swallow is easier. Throat clearing. This is often associated with a feeling that there is a film over the back of the throat that needs to be coughed out. People with LPR generally do not have stomach acid problems / heart burn / indigestion as this is a separate problem. Treatment for LPR is generally quite simple if caught early enough and medication is taken correctly. There are very typical signs also seen during an endoscopic examination of the throat. Having tonsillitis, or pharyngitis (infection of throat without tonsils), or even infections of the nose (like sinusitis), or ear can lead to a sensation of a lump in the throat. Sinusitis is also associated with a Blocked Nose and catarrh. Occasionally patients who snore a lot have a sensation of a lump in their throat. 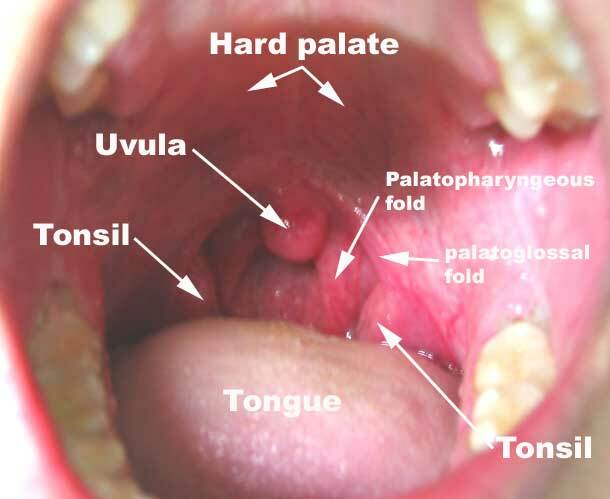 This is because the uvula vibrates during snoring in most people, and this can lead to an inflamed and swollen uvula. This leads to a feeling of a lump in the throat but also with time makes the snoring worse. Typically the sensation of a lump in the throat is worst first thing in the morning. If your uvula is red and inflamed in the mornings and you snore a lot, please look at the Snoring and Sleep Apnoea page. Having very large tonsils (especially ones that meet in the midline), often gives the sensation of a lump in the throat. Sometimes very large adenoids can push against the palate and give the feeling of a lump high in the throat. Dealing with Tonsils and Adenoids is covered on that page on this website. The base of the tongue is right at the back of the throat. People sometimes touch this area with their fingers if they are trying to vomit. There are a few different reasons for having a large tongue base, and these can often be diagnosed with an endoscopic examination in clinic. Many people with a large tongue base also have sleep apnoea. Please refer to the Snoring and Sleep Apnoea page for more information. Treatment is relatively simple, and can involve just medication. There are many different types of cancer that affect the throat. Many of which can cause the feeling of a lump in the throat. Fortunately these are all relatively rare, but especially smokers who are older than 40 should have a full examination to rule out any suspicious lumps. This can be done with an endoscopic examination in clinic, and some patients may require scans and examination under anaesthesia to be entirely certain.